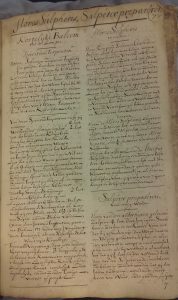 Today I want to go back to the first post in my series with Saskia Klerk (last post here) to consider in more depth the order in which recipes were written down in manuscript BPL3603. We initially mentioned that the recipes are initially ordered in alphabetical sequence. That, combined with the limited open space left in the book, made us think that the manuscript was carefully designed as a more or less final record of recipes. After a closer look, however, it seems that the manuscript is not as “neat” as it appeared at first. 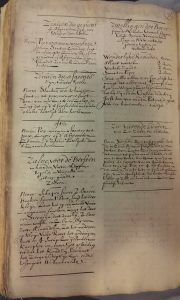 University Library Leiden, MS BPL 3603, p. 77, the first page of section 2. Most of the recipes and texts that Saskia and I have been discussing in this series come from the second part of the manuscript, which starts on page 77. Unlike the first part, there is no longer an alphabetical order. This section starts with a recipe for the preparation of Flores sulphurous, a strong powder. It continues with several other waters, and powders, mostly made through chemical processes. There are also recipes for the preparation of colour paints, made from saffron and red coral respectively. It describes recipes for different types of oils, and it contains the recipes and text about the plague by Van Helmont and discussed here, as well as the text taken from Van Beverwijck discussed here and here. I am starting to suspect that the second part of the manuscript (pp. 77-122) consists of text passages copied out of other books. While the first part of the manuscript might be taken from other books as well, it is organised on the level of the recipe, whereas the second half consists of longer text fragments on certain topics, such as oils, or colour making, or even the plague and stones. This calls for a more precise study into the quire binding of the manuscript, to see whether it was bound in this way, or whether it was a later organisation of the papers. I doubt it, especially since the page numbering seems contemporary, and is continuous. The first part of the manuscript completes a full alphabetical series from A to Z. Was this part finished earlier? And were the recipes of part 2 added later without specific order because the alphabetized papers were full? Possibly, but from the handwriting it is not clear that there might be a time gap between part 1 and 2. Part 1 might have been an earlier collection of the scribe, collected in a notebook or on paper slips, and copied into this manuscript, which would then have formed the basis for further collecting. 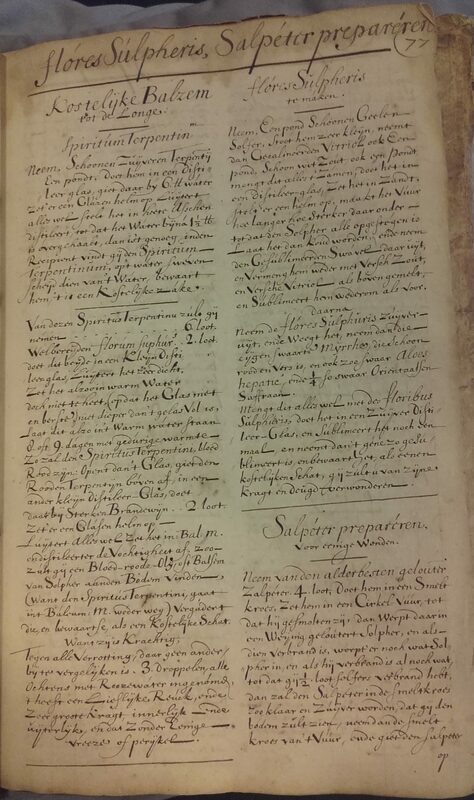 University Library Leiden, MS BPL 3603, p. 76, the last page os part 1, discussing Zee-ziekte. 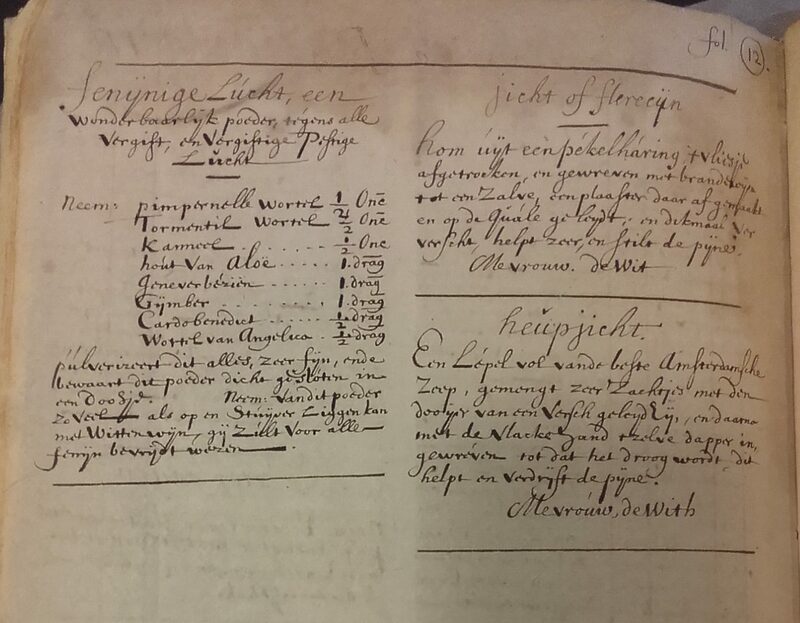 The manuscript starts the ‘A’ for “amborstigheit” (shortness of breath) and finishes with the last entry on p. 76 under ‘Z’ “Zee-varende luijden voor zee-ziekte te behouden” (to protect sea-farers from seasickness). Within the order, we nevertheless find unexpected recipes. Most of them are ordered according to the illness they are supposed to cure, but under ‘D’ we find drunkenness, drinks, and the art of distilling (“distileer-konst”). 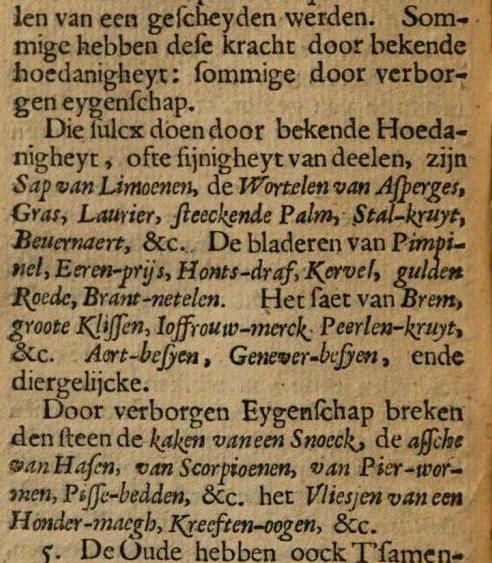 And even though beer was sometimes used as medicine (see for example this blog post), in this case it is purely mentioned for its ‘pleasant taste’ (“zeer aangenaam van smaak”). University Library Leiden, MS BPL 3603, p. 12, with the final F-recipe (Fenijnige lucht) and two J-recipes (jicht). Every now and then there seems to be a small glitch in the order, such as the recipe for gout (“jicht”), which is placed after ‘F’ and before ‘G’ on a page with quite some space left. Surprisingly we find exactly the same recipe again at the end of ‘J’, even with the same reference to Mrs de Wit who is apparently the author or source of the recipe. It seems that the restriction of space on the J-page made the scribe go back to the almost empty F-page. Sometimes the reader also needs to use his or her imagination to understand the alphabetical order, such as with the recipe to improve the memory (“memorie”). It can be found in the middle of the K-section, and features brandy (“brandewijn”) as the main ingredient. However the title of the page (which is not always similar to the titles of the recipe(s)) reads The Power and Virtue of Brandewijn (“Kracht en Deugd des Brandewijns”), which is where we have found the ‘K’. In the eleventh chapter of his Steen-Stuck (Treatise on the Stone, 1637), Johan van Beverwijck related a story of an encounter in Dordrecht, the Dutch city where he was town physician. A man had shown him the pieces of stone that he said had been broken by the following recipe. Van Beverwijck tried it himself, but had not found the same results. Still, he noted, the pieces of stone that the “trustworthy man” showed him, would together make up a large stone. 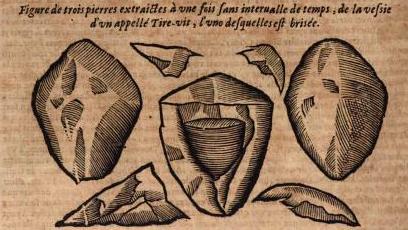 Broken bladder stones from Des monstres et prodiges (1573) by Ambroise Paré (c. 1510– 1590). From the Lyon edition of 1664. 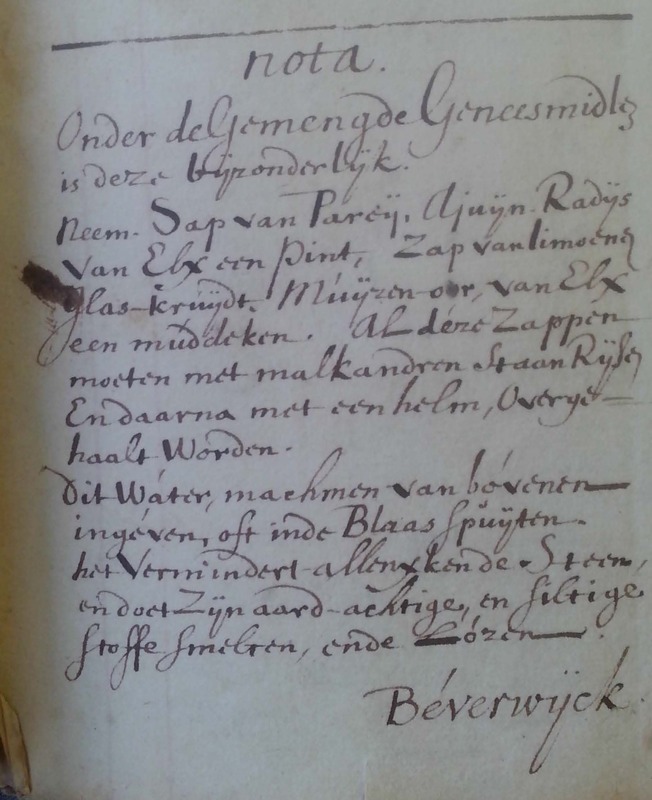 Around 1677, the compiler of Ms BPL 3606 copied this passage, leaving out Van Bever-wijck´s skeptical remark. Apparently, he found the display of broken stones, a tactic we have encountered before, to be persuasive proof of the recipe´s effectiveness. 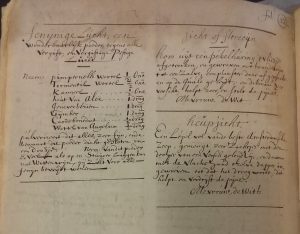 When Sietske and I started our blog series on this Dutch recipe collection, I did not expect most of my posts to be about “stone breaking” remedies such as this one. However, they turned out to have been of particular interest to its compiler. By pursuing this interest, Sietske and I have learned quite a bit about him and his world. For example, we now suspect that he lived in or near the province of Zeeland in the south-west of the Dutch Republic. We also confirmed Sietske´s earlier observation, that the compiler especially noted down remedies that where accompanied by favorable experiences. In my last post, I showed that the compiler of BPL 3606 used Steen-Stuck´s tables of contents to find the information he was looking for. As I continued studying the manuscript, the question of why there are so many stone-breaking remedies in it became more pressing. In an earlier post, Seth LeJacq laid out the persuasive answer that patients’ fears of surgery led them to explore alternative therapies. Master Reijmers´ story has shown us that the compiler of BPL 3606 shared these fears and desires. Perhaps, this is also key to understanding why he included not only so many recipes for stone breaking remedies in his manuscript, but also three other sections from Steen-Stuck that are not recipes. Before the recipe, as a “Nota”, the compiler copied a short section on how the stone should be returned to the bladder if it got stuck in the bladder´s neck. In his Treatise on the Stone, Van Beverwijck suggested surgical options to actually remove the stone from the body as well. The compiler copied the most curious of these, after the recipe, as another “Nota”. This particular option advised sufferers to blow into the urethra with a little pipe. Thereby extending it far enough to be able to remove a stone no larger than an olive pit. 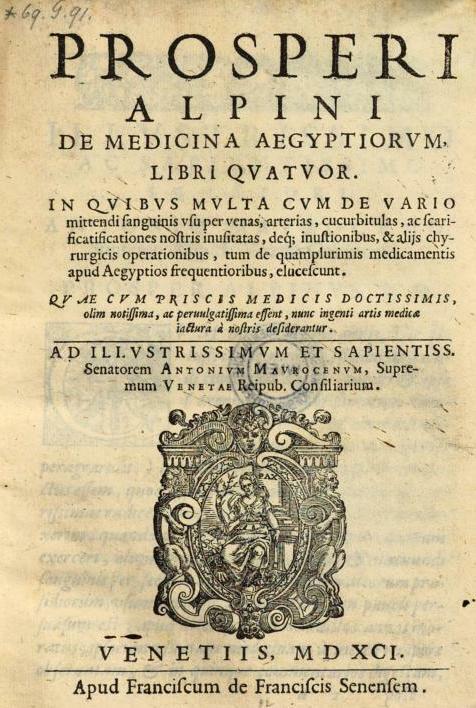 Despite his interest in the cure, the compiler omits the original source of this procedure, Van Beverwijck´s teacher in Padua, Prosper Alpinus (1553-1617) and the Egyptians amongst whom Alpinus had resided. The inclusion of treatments such as these further confirms the compiler´s anxiety towards actually cutting the body. Moreover, I would argue this anxiety was a factor in the transmission of this custom from faraway Egypt to this Dutch recipe collection. Alpinus explicitly mentioned the non-cutting aspect of the procedure in the title of the chapter in which he described it. Van Beverwijck repeated this aspect in Steen-Stuck, before going on to describe cutting the body to remove the stone as a last resort. Finally, in his exploration of alternative therapies the compiler also recorded knowledge that by 1677 was outmoded to many of his contemporaries. Van Beverwijck named several materials that possessed a stone breaking power. Some of these (such as lime zest and laurel) worked by a manifest quality and others (such as ashes of scorpio and woodlice) by a hidden property. In his note-taking, the compiler was careful to separate these into two lists. The distinction between manifest and hidden or occult qualities was characteristic of academic Galenic medicine familiar to Van Beverwijck. It was fundamental to explaining the properties of medical materials. Was the way a material worked in the body “manifest”, that is, was it caused by the primary qualities (hot, dry, cold and moist)? Or could this “operation” not be explained from these qualities and was it therefore “hidden”? While this important distinction had come to be questioned by the 1620s, as I described elsewhere, Van Beverwijck included it without comment. Accordingly, when the compiler copied out this section, all that mattered to him was that the physician asserted the healing properties of these materials. Here, the compiler´s fear of cutting the body thus resulted in a quite eclectic collection of materials, surgical techniques and a stone-breaking recipe, originating from as diverse places as Egypt and Dordrecht. Investigating his interest in alternative cures for bladder stones further, has also indicated the practical reasons behind the staying power of (parts of) Galenic medicine, despite its philosophical problems. Saskia Klerk, “The Trouble with Opium. Taste, Reason and Experience in Late Galenic Pharmacology with Special Regard to the University of Leiden (1575–1625),” Early Science and Medicine, vol. 19, issue 4 (2014): 287-316. 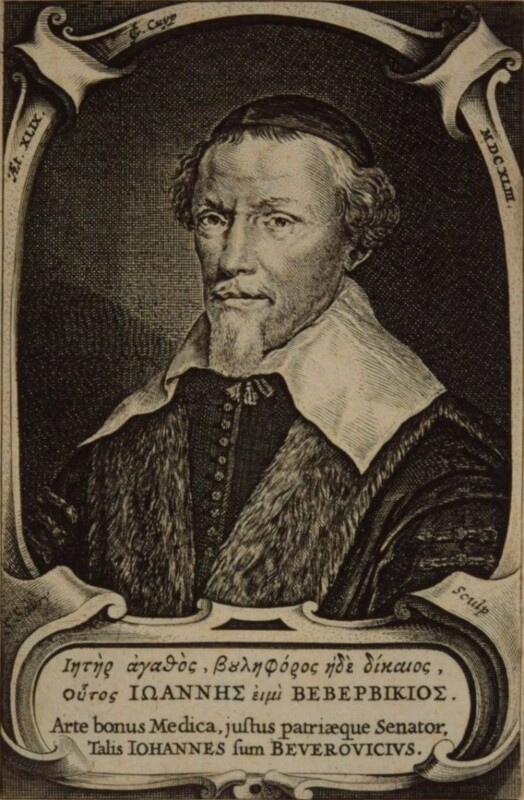 Johan van Beverwijck (1594-1647), who we introduced in our first post, was one of the most prominent medical authors of the Dutch seventeenth century. His Steen-stuck [Treatise on the Stone] (1637, 1649, 1656) was the first of his publications in which he proposed not only how to prevent a disease, but also how to cure it. The treatise was rather conventional in its structure however. 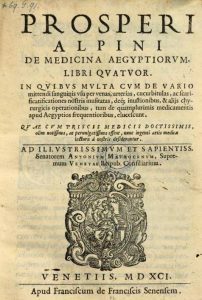 Being a learned physician, Van Beverwijck discussed where in the body gravel and stones occured, their cause and signs or symptoms and prevention as well. The compiler of our manuscript (BPL3603) was exclusively interested in chapter eleven, about both medicinal and surgical treatments. Similar to his dealings with Van Helmont´s work on the plague, the compiler consulted a treatise about the particular affliction he was interested in. He copied five passages from Steen-Stuck into the manuscript, alongside his discussion of master Reijmers, which I examined previously. As a “Nota” to Reijmers´ recipe, the compiler first copied a recipe that Van Beverwijck singled out amongst several compound medicines. 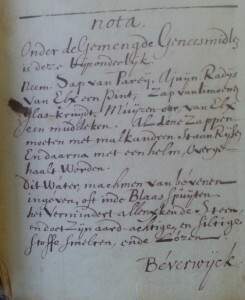 University Library Leiden, MS BPL3606, p. 121 (selection): first passage copied from Steen-stuck under the page heading “Tried remedies to break the stone”. The use of the word “Nota” signals that Van Bever- wijck´s recipe functioned as a comment on Master Reijmers´ , as another example of a stone-breaking remedy. The compiler cited Van Beverwijck as its source, rather than “Dr. Quercetanus´ Pharmacop. Dogm.”, to which Van Beverwijck referred. The compilers´ choice for this recipe as the first passage to copy from Steen-stuck, deserves further attention because it shows how he read Van Beverwijck´s treatise. The recipe wasn’t the first in the chapter and earlier passages in the source text are copied later in the manuscript. The content description at the start of the chapter explains the compilers´ choice. The eleven chapter parts are numbered and named. They move from the lightest treatments to the severest: that is, from treatments that would make it easier for a stone to move out from the bladder naturally, to those requiring an operation to remove it. The compiler disregarded this structure and skipped to number six, “on compound medicines to break the stone“. This brought him straight to the recipe that he copied under the page heading “Tried remedies to break the stone“. The content description thus helped him find what he was looking for, information about stone-breaking compounds. Van Beverwijck had built in a structure by which Steen-stuck could be read from front to back, from the causes of stones to their cure. The content descriptions at the beginning of each chapter however, facilitated different ways of reading the treatise. From this manuscript, we can tell that the compiler used this navigation aid quite effectively. After including the anecdote about the hare-catching boy in the manuscript, the compiler apparently returned to this chapter in Steen-stuck. His interest in stone-breaking remedies brought him to number four in the chapter, to “those <medicines> that break the stone”. From there, he read through the rest of the treatise and selected four more passages to copy into his manuscript. These selections I will cover in part two of this post.